Citing a late production start, a new report claims that while the "iPhone 8" will be up for pre-order on Sept. 15, it will not start shipping to customers until some point in October. Enthusiast site Macotakara cited supply chain sources in its claim on Thursday of October shipment for the high-end OLED model. However, the conventional LED models, known colloquially as the "iPhone 7s" series, should be available a week later -- on Sept. 22 at retail and to pre-order customers. It is not clear what the reports are based on. After a summer of claims suggesting that there would be either none of the OLED "iPhone 8" available at launch, or that Apple would delay the launch because of low quantities, recent reports suggest that Apple will have a limited quantity of the device ready to go in September. A report on Wednesday suggested that historical trends would be adhered to, with preorders of the announced items starting the Friday immediately following the launch event. In 2016, the iPhone 7 was announced on Wednesday, Sept. 7, with preorders starting on Sept. 9. The devices shipped to customers a week later, on Friday, Sept. 16. 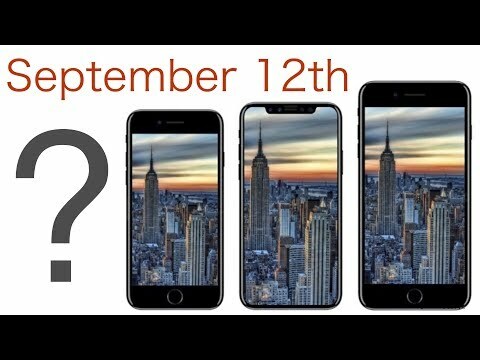 As far as naming goes, a pair of conflicting rumors emerged on Sept. 1, suggesting that the next range of iPhones would eschew the "iPhone 7s" branding, and skip straight to the "iPhone 8" name for the entire range. One account claims that the high-end OLED device would be called the "iPhone 8 Edition" and the other the "iPhone X." Should the "s" cycle be skipped this time around, it would be the first time since the iPhone 3GS was released to replace the iPhone 3G. Apple is expected to announce the three new iPhones with the high-end OLED model, and two other devices expected at a Sept. 12 press event. Also expected is a refresh of the Apple TV adding 4K video as a playback option, and an LTE-equipped Apple Watch. Love these rumours , does anyone really think that a company with more money than the US Gov , wouldn’t have the I8 already manufactured etc and all ready for shipping. Apple just wants to be the last in introducing a product. Pixel, Microsoft launches in October. There we go. There's the pie eyed "Apple can do anything" and resources, the physical world, and reality be damned comment I expect from a certain type of forum member. Perhaps you should consider the many, many hardware and software that was both not ready to ship immediately after an event, didn't have ship dates until later in the year, the next year, or was given a date and then still failed to meet that date or was shipped with such limited quantity that pre-ordered and delivery times were a long ways out. You really think Apple never has issues? Apple has messed up, missed deadlines, scrapped features at the last minute, can’t get what they want, pushed back, and all the other things that go wrong when making products. Unless you think only Apple never has these types of issues but every single other company in history has. Apple is not perfect but they do what they can to bring the best products out year after year. If this is true then the photo i saw the other day with pallets and pallets of iPhone 8 must be fake which one is it haha? Why must that be fake? There will be an abundance of iPhone 8 and iPhone 8 Plus available on Sept. 22. iPhone Edition (or whatever it is called) is another story. 1. There will be zero retail store inventory of iPhone Edition on the 22nd. 2. There will be a few thousand pre-ordered iPhone Edition delivered on the 22nd, with more coming each day thereafter. 3. Shipping estimates will be into late November starting about 10 minutes after pre-order goes live, and remaining that way for some time. 4. Finding one in store before November will be nearly impossible. Actually, the article does mention how all other recent information indicates that iPhone Edition will indeed be available at launch, albeit in very constrained quantities. While anything is possible, it is insanely unlikely that Apple will have zero iPhone Edition ready to ship that week. It won't be zero. It will, however, be so few that it may as well be zero, as far as most shoppers are concerned. If I were to use the Jet Black 7 Plus last year as an example (which I already did)...I would guess that maybe 1% of those who pre-ordered within the first hour actually received a unit on launch day last year. I would expect about the same for the iPhone Edition this year, as all the same patterns and trends of information are repeating themselves. There were plenty of sources last year convinced that the Plus model "would not launch" until October or November. That was, of course, absurd then, and it isn't any more accurate now. The truth is far more complicated, as it always is with supply chain. What?? Read it again because I'm pretty sure that's exactly what the AI article is reporting. The iPhone 7s/8's available near immediately while the Edition/X/Pro or whatever it's called shipping sometime in October. "Enthusiast site Macotakara cited supply chain sources in its claim on Thursday of October shipment for the high-end OLED model. However, the conventional LED models, known colloquially as the "iPhone 7s" series, should be available a week later -- on Sept. 22 at retail and to pre-order customers." All these delay talks are contrary to Apple guidance for this quarter. Only the Pro/Edition/X OLED version is rumored to be delayed. All well on the Western Front for the LED display 7s/8's so nothing counter to Apple's guidance IMO.